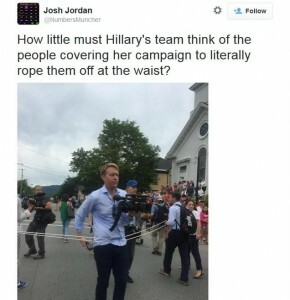 Hillary spent Independence Day corralling her dependent traveling press corps behind a rope — literally. This is a prime example of how Hillary’s imperious nature created a visual that telegraphs to voters how she wants to campaign in a bubble and isn’t really interested in transparency. Can you imagine a Republican being able to rope off the press corps without it damaging their image?